I love the TV show, Judge Judy. Judy Sheindlin is no Give Away Girl. In fact, did you know she is one of the highest paid people on TV? 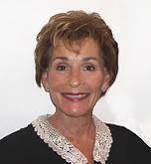 She makes about $45 million a year because she gets proceeds from every Judge Judy show that airs. For that, I would wear that ridiculous collar too. Nice negotiating for yourself, Judy. As an aside, I had a Halloween party years ago where everyone was supposed to come in costume. My good friend Tanya came as Judge Judy with a wig, collar and black gown. I don’t know how she didn’t win the best costume contest. No one had met Tanya before and, hilariously, everyone else assumed that that (see picture) was Tanya’s real hair cut. The wig was so good no one could tell. The next time the other friends ran into Tanya, they kept whispering to me how much better they liked Tanya’s long brown hair versus her “old” hairdo. I laughed and laughed. Again and again, Judy regales these women with quick sound-bite lectures about simple facts. She points out that a guy who has three children from three different women is unlikely to pay you back for that black Trans Am you bought him, especially if he doesn’t have a job. In contrast to the Give Away Girls on Judge Judy, you’ve got your Gimme, Gimme, Gimme (GGG) Girls. These are the daughters, sisters and friends who go back on their word or their contracts because they simply didn’t feel like following through. They take advantage of the kindness and generosity of others. One GGG Girl told her stepdad she would pay him back for a car he bought her. She didn’t. The stepdad testified that she had agreed to use the car to pick up her sister at school and to pay him on a monthly basis. She dropped both balls. Her response? “Things changed. Why should I pay for a car I don’t even use?” she argued, indignant and annoyed that she should have to pay anything when she changed her mind. She wasn’t a detrimental caretaker, she was a plain old narcissist, and it’s no fun being in a relationship with someone like her. Men and women who have caretaking qualities need to be careful when entering into relationships. Narcissistic people like the flaky car girl do exist. And, current research suggests that narcissism is becoming widespread. So keep watch.